Build your students’ typing fluency all year long. Keyboarding Without Tears is a K-5 web-based curriculum that makes it easy for teachers to teach their students the pre-keyboarding and keyboarding skills- such as typing, general computer readiness, digital citizenship and online test prep – they need to succeed on any assignment, in any setting. Keyboarding Without Tears is the proud recipient of the ISTE Seal of Alignment! Why It Works Typing, test-prep, and tech knowledge! Developmentally appropriate, grade-level lessons promote success. Self-directed, game-based activities engage students. Integrated assessments and teacher dashboard help you easily measure and share progress. Easy-to-use teacher guidelines and lesson previews for empowered teaching. Easy to access, easy to implement. Keyboarding Without Tears is easily accessible from any internet-connected device for both classroom and school-to-home connections. 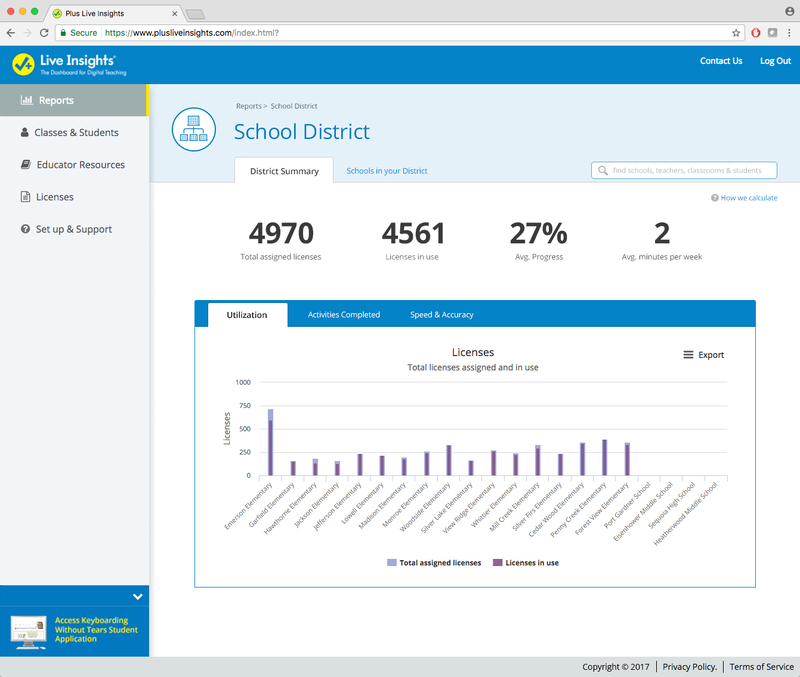 With a user-friendly, intuitive teacher dashboard, Keyboarding Without Tears integrates with various Student Information Systems for simple student setup and management. What is the recommended level for a child to start using the program? The program is grade-level appropriate and designed for each child to work at their applicable grade level or reading level. Each license comes with options for reviewing or advancing levels. How do I log in and access my licenses? After you’ve received your allocated licenses and invitation email, go to Plus Live Insights or click the link in the invitation email. Log in with your Learning Without Tears account. If you don’t already have an account, create one by clicking Create an account and filling in the fields with the correct information. Once you log in, your license(s) will be available. Yes! We have several training options including in-person training and virtual training. Visit the training page to learn more about our Keyboarding Without Tears workshop options.